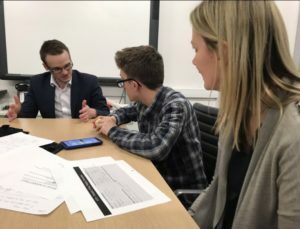 Young People at Blackburn Youth Zone have been taking part in mentoring sessions delivered by local businesses in preparation for a special competition aimed at encouraging the entrepreneurs of tomorrow. Blackburn Youth Zone has partnered with SoupOTG to deliver a youth-led version of their popular event format which is a Dragons Den style event. Soup OTG is a community crowdfunding soup-catered social evening and funding initiative. On the evening of the event, several young people will present their project idea in a bid to win your vote and secure funding to launch their plans. The young pitchers will deliver their final project pitch to a public audience on the 27th February 2019 at Blackburn Youth Zone from 7:15 pm, accompanied by their mentor. Should they win the pitch, they’ll secure starter funding to launch their idea. 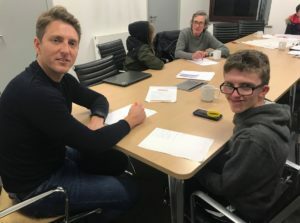 HSBC, Plenary Marketing, Organic Insurance, Pendle Consulting and Robin Oatridge & Co are businesses that have been supporting Blackburn Youth Zone young entrepreneurs by providing finance, marketing and presentation skills workshops; as well as providing one to one business mentoring. Established seven years ago, Blackburn Youth Zone provides a wide range of activities for young people aged 5 to 19 years old. With an entrance fee of just 50 pence, activities range from sports to arts, crafts and games. Facilities include a canteen, basketball courts, rooftop football pitch, climbing walls, dance studio, fully-equipped gym, live music room, electronic music room and a gaming room. Please come and attend this event as a community member or business, enjoy soup and social time, and vote on your favourite pitch. Contact melanie.thomas@blackburnyz.org to book on. For further editorial information, please contact Melanie Thomas at Blackburn Youth Zone on melanie.thomas@blackburnyz.org or 01254 292000.